NIH Clinical Center (in Bethesda). Photo courtesy of the National Institutes of Health. A "house of hope, where science and compassion come together to save our lives"
The National Institutes of Health is a collection of government-operated biomedical research institutes. The National Cancer Institute, created in 1937, has in many ways served as the model for the many institutes that have followed, created by Congress, often at the urging of others, especially advocacy groups. There is no consistency to the categories they represent. Some institutes are organized around a disease (such as cancer or allergy and infectious disease), some around an organ system (such as eyes, or heart, lung, and blood), some by life stage (child and human development, and aging), some by field of science (general medical sciences, environmental sciences, human genome, mental health), some by profession or technology (nursing, biomedical imaging and biomedical engineering). Ninety percent of NIH-funded research is “extramural,” carried out by other (mostly academic medical) organizations all over the country. Only 10 percent of the research funding is spent on “intramural” research, done on NIH’s Bethesda campus. Some of the research involves basic science (performed in laboratories or in experiments with animals). Some of it is clinical research—meaning it’s conducted on human patients. When intramural NIH investigators conduct clinical research, they do so in the NIH Clinical Center. Read Lynne Lamberg's featured story about it (New Home for Nation's Research Hospital) in the May 4, 2005, issue of the Journal of the American Medical Association. NIH Research. NIH RePORTer (NIH Research Portfolio Online Reporting), a searchable database on federally funded biomedical research projects and programs. News updates here. 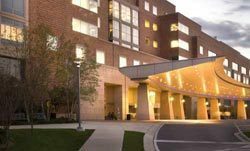 On my first walk around Building 10 — the NIH Clinical Center in Bethesda, Maryland — I chatted briefly with a nurse on the pediatric cancer ward. “We see miracles happen here all the time,” she said. I have learned that these miracles are often the product of dedicated and compassionate work by many very smart people who want to make a difference and do. Taking the best science has to offer, they are constantly thinking about new ways to deal with unsolved medical problems, coming up with solutions, and passing them on to the rest of the medical community, while they find new problems to tackle. The staff offers a level of patient care most of us thought had been managed out of existence. And the Clinical Center and the institutes have provided training and formative experiences for a sizeable proportion of the nation’s — and increasingly the world’s — biomedical establishment. The Clinical Center is not the kind of place you come to for an appendicitis attack or to have a baby. If you broke your leg walking down its corridors, you would probably be taken across Old Georgetown Road to Suburban Hospital to have it set. The Clinical Center exists to provide patient care in the context of clinical research, and if you have the bad luck to have a medical problem that standard medical practice can’t deal with—but the good luck to qualify for one of the institutes’ protocols—there is probably no better place to be. Research protocols may be interventional (experimental studies in humans to investigate the safety and/or efficacy of a drug, gene therapy, vaccine, behavior, device, or procedure) or observational (to record specific events occurring in a defined population). Observational protocols include natural history, screening, and psychosocial studies. Clinical trials of new drugs account for roughly half the protocols in the Clinical Center. Most of the clinical trials conducted here have been phase 1 or 2 trials, testing for safety and efficacy. These trials mark the first time these agents have been tested in humans. After these early studies, the drugs move into phase 3 trials, which are usually conducted off-campus in large populations by extramural researchers. Back at the Clinical Center, intramural researchers then turn their attention to other challenges requiring innovative or untested research that couldn’t easily be done elsewhere. The other half of the protocols involving Building 10 are natural histories of diseases—often rare diseases—to elucidate their pathogenesis and to develop new medical interventions or approaches to diagnosis, prevention, and treatment. The natural history studies are typically long-term studies, usually involving patients from all over the nation and sometimes the world. Many of these studies go on for decades, with investigators studying patients from infancy through adulthood. Many of these studies probably would not have been done if they had not been done in the Clinical Center. There is no other hospital like it. The Clinical Center supports about 1,000 active clinical research protocols. Its projected hospital admissions in 2003, with a 267-bed capacity, are 6,723, plus an expected 98,172 outpatient visits. Investigators will see 9,175 new patients in 2003, bringing the total number of active patients to 80,245. It has the largest population of patients with rare diseases anywhere. The Clinical Center itself employs a staff of about 2,000, in addition to which staff and fellows of the various institutes work in Building 10. The Clinical Center’s job is to provide the resources the institutes need to carry out their research and patient care missions. Neither a conventional hospital nor a medical school, the Clinical Center had no interns or residents—and it needed young doctors to provide patient care. The system for providing such care from the very first was to bring in “clinical associates,” young physicians and dentists who during their internship or residency arranged two years in advance to come to the Clinical Center for two years of training in clinical and laboratory research. During their first year, they provided patient care; during their second year they worked in a laboratory with the senior investigator who had selected them. This was at a time when graduates of medical schools had little or no training in research or in scientific method; they certainly didn’t get it in medical school, where the emphasis was on clinical practice. The NIH is not a university, although there has been some discussion of developing a graduate school on the campus, but the senior investigators work closely with and depend on their trainees. Long-term technical staff provide a lab’s long-term memory, but much of the work is done by the trainees in the clinical program and by MDs and Ph.D.s who come through for basic laboratory training. The Clinical Center offers less formal teaching than a medical school but the clinical associates have benefited from training in the form of day-to-day interactions and critiques of their work. The Center owes its strong start partly to a brilliant recruiting device. The outbreak of the Korean War in June of 1950 had created a consensus for a “doctor draft” to provide the physicians and dentists needed by the military. An amendment to the Selective Service Act passed in 1948, in the early days of the Cold War, revived the government’s authority to draft young men into the military. The prospect of two years’ obligatory service in the military influenced many to try a stint in medical research. For the two decades that the doctor draft continued (it ended in 1973), the Clinical Center had its pick of candidates from the top medical schools. People who would never have considered leaving the elite medical schools for the NIH did so for two years in lieu of military service. Tony Fauci remembers a recruiter from the Armed Forces coming to Cornell in 1966, when he was about to start his internship and residency. Early in the fourth year of medical school, they gathered in Cornell’s auditorium—79 men and two women—and the recruiter said, “Believe it or not, when you graduate from medical school at the end of the year, except for the two women, everyone in this room is going to be either in the Army, the Air Force, the Navy, or the Public Health Service. So you are going to have to take your choice. Sign up and give your preferences.” At the time the NIH was just blossoming, says Fauci, and everyone who had any role in academic medicine spent some time there, so he put the Public Health Service as his first choice, followed by the Navy. They call themselves the “yellow berets.” No one is certain when the phrase originated. For some the term must have conveyed a derogatory meaning, contrasted with the “green berets” (Special Forces Operatives trained for fierce combat in Southeast Asia). But by the war’s end most associates “used it as a badge of pride,” says Melissa Klein, author of “The Legacy of the Yellow Berets” and daughter of Harvey Klein, head of the Center’s Department of Transfusion Medicine. There was a period during the doctors’ draft when two thirds of the Harvard medical students applied to the NIH. They came not only to avoid the draft but also because it had become the place to be. The excitement of the new venture drew young investigators from all over the world, who came to learn, make their mark, and (usually) return to their home institutions. Some came intending to go into a special medical practice, says Tom Waldmann of the Cancer Institute, who also started as a clinical associate. But “some you could capture, some you could induce to stay.” Many of the great names in medical science got hooked on research and stayed. And given full support, they made discoveries at an amazingly rapid rate. Their two-year period at the NIH gave many of these doctors their first taste of research, which they continued when they returned to academia. The NIH became an important training ground for the nation’s biomedical researchers, who, during their training period, provided care for the Clinical Center patients. It was, for many, a transforming experience. The Clinical Center provided superior facilities for research training and excellent mentors, including several Nobel laureates. Clinical associates had a chance to work with world-class scientists and their peers were top graduates from the country’s elite medical schools. The NIH’s seminars and courses were as good as those at any university, and one had only to walk down the hall or to the next building to find someone to answer a question, such was the critical mass of experts on campus. The program trained them to be clinical investigators rather than just skilled practitioners. “To their solid medical education was added scientific knowledge and experimental techniques,” observes Melissa Klein, “and in their career-oriented minds was implanted a vision of the physician-scientist who would discover fundamental biological mechanisms and apply those insight to the cure of disease.” The associates became some of the nation’s most skilled researchers, part of an international network of scientists. They went on to train new generations of researchers—and to increase the number of centers at which such training was offered. When the doctor draft ended, well over half the leadership in biomedical research had spent a couple of years at the NIH — which meant they spent time at the Clinical Center. The spectacular launching of clinical research that began in 1953 spawned a generation of research scientists in the 1950s and 1960s who established new centers of scientific creativity throughout the United States. Building 10 became a center for studying and training in clinical research as much as it was a place to conduct clinical research. “This hospital is a jewel in the medical universe. For someone like myself who wants to do serious science and seriously apply it—in my case, finding new treatments for patients with cancer — there’s no place in the world like the Clinical Center of the National Institutes of Health. “We have spectacular research resources. We have 250 state-of-the-art hospital beds married to world-class research facilities and world-class scientists—over 2,000 PhDs who are doing basic scientific research, eager to collaborate with clinicians. Half of all the clinical research beds in the United States are in this building, paid for by the U.S. government for the sole purpose of developing improved management for patients. “This gives us an opportunity to do things that would be very, very difficult to do elsewhere. We have our own research laboratories literally a few steps away from our patient wards, and often we literally carry the materials we develop from the laboratory to the patient wards for treatment. This intermingling of scientists with clinicians and clinician-scientists creates an environment that is unsurpassed for enabling innovative, groundbreaking research. “Of course, the treatment was not all sweetness and light . . .but because you are treated here, you are sometimes in the company of many people who are far more ill than you are, who clearly will not have an ideal outcome . . . . You see all around you the full panorama of life and death, and with this reality comes, at times, enormous inspiration at the power of the human spirit…. It is the family of man here—in all its glory and misery, pain and celebration. It is real life, here in the House of Hope. Read more about the NIH Clinical Center in Pat McNees's book about it, Building Ten at Fifty: 50 Years of Clinical Research at the NIH Clinical Center. • A Failure to Heal (Siddhartha Mukherjee, NY Times Magazine, 11-28-17) Sifting through the medical rubble when a clinical trial falters. • The Changing Face of Clinical Trials (New England Journal of Medicine, 2017) collection of articles that examine the current challenges in the design, performance, and interpretation of clinical trials. • Study questions animal data underlying many clinical trials (Emma Yasinski, Science, 4-5-18) "Over the past few years, researchers have repeatedly shown that many animal studies lack scientific rigor; they are often prone to biases, for instance, and are sloppily reported in scientific journals. The team behind the new study looked specifically at the information researchers prepare to justify clinical trials in humans, which can cost millions of dollars....The team found that 89% of the animal studies were not published at all, making it impossible for the IRBs to know whether the study had been reviewed by other experts. Additionally, fewer than 5% included important information on whether bias-reducing methods such as randomization of the experimental groups were used, they report today in PLOS Biology....Lastly, 82% of the brochures only reported studies that had positive effects. That suggests that trial sponsors leave out the less flattering studies....he new study helps explain why so many results in animal studies don't hold up in human trials, says Malcolm Macleod, a neurologist at the University of Edinburgh in the United Kingdom. Less than 10% to 15% of clinical trials are successful." The new study may help explain why so many encouraging results in animal studies don't hold up in human trials. • NIH hospital’s pipes harbored uncommon bacteria that infected patients (Ike Swetlitz, STAT News, 12-26-18) Includes a great photo of the Clinical Center with many other National Institutes behind it. A study in the New England Journal of Medicine found that "from 2006 to 2016, at least 12 patients at the NIH Clinical Center, which provides experimental therapies and hosts research trials, were infected with Sphingomonas koreensis, an uncommon bacteria....infections like this are not uncommon in medical centers — the Centers for Disease Control and Prevention estimates that about 4 percent of hospital patients pick up diseases from the hospital environment....The cluster of Sphingomonas infections prompted researchers to search the hospital’s water infrastructure to see where the bacteria might have been hiding out. They found Sphingomonas koreensis living in water that came out of the faucets in patient rooms, as well as inside the sink faucets themselves." • NIH in uproar over report slamming Clinical Center, leadership shakeup (Jocelyn Kaiser, Science Magazine, 6-3-18) A balanced piece, which takes into account the complexity of a hospital that is doing clinical research, with researchers from many different institutes, and with the problems inherent in unsettled funding (as a federal hospital and clinic). • NIH needs to raise the bar for funding alternative medicine research (Henry I. Miller, STAT, 2-26-18) One branch of the NIH is far less equal — in the sense of both scientific rigor and importance — than the others: the National Center for Complementary and Integrative Health (formerly the National Center for Complementary and Alternative Medicine). Grant proposals for complementary and integrative health studies could be evaluated more effectively by other NIH institutes or centers. • NIH to require more transparency for clinical trials (Tara Haelle, Covering Health, Association for Health Care Journalists, 2-22-18) The ongoing push for open science and greater transparency in medical research just notched another win following new rules from the National Institutes of Health regarding federally funded research involving humans. The NIH is broadening the definition of clinical trials for what must be registered and reported at ClinicalTrials.gov. • How to Read a Clinical Trial Paper: A Lesson in Basic Trial Statistics (Shail M. Govani and Peter D. R. Higgins, Gastroenterol Hepatol, April 2012) While the number of clinical trials performed yearly is increasing, the application of these results to individual patients is quite difficult. • Kentucky sisters now have clues to lifelong, painful disorder (Medline Plus, Spring 2011) "By the time she was 18, pain in her hands drove her to the doctor—she thought arthritis—but the tests came back negative. By her 30s, the pain in her legs was so bad it prevented her from getting a good night’s sleep. Local doctors didn’t know the cause but suggested arterial surgery could help, although she would need to repeat it every five years. Paula declined....Finally, in 2009, Louise’s physician, Karen Saylor, M.D., of Mount Vernon, Ky., referred Louise and Paula to NIH’s Undiagnosed Diseases Program (UDP), a unique three-year-old NIH multidisciplinary initiative that seeks to provide answers to patients with mysterious conditions that have long eluded diagnosis, and advance medical knowledge about rare and common diseases. Accepted into the UDP that May, the sisters, their three siblings, and their parents (who do not have the disease) visited the NIH Clinical Center for a week of intensive clinical and laboratory testing, evaluation, and consultation. It was worth it. Clinical investigators from the National Human Genome Research Institute (NHGRI) and the National Heart, Lung, and Blood Institute (NHLBI) found that the pain Paula, Louise, and their siblings continue to suffer is due to ACDC, a rare genetic disorder that permits calcium to build up in arteries below the waist and in the hands, blocking blood flow and making walking and other movements painfully difficult. Fortunately, ACDC spares the arteries of the heart." • What's Wrong With Summer Stiers (Robin Marantz Henig, NY Times Magazine, 2-18-09), through a patient's story we learn more about NIH's new Undiagnosed Diseases Program, under superdiagnostician William Gahl. • Trial and Error (Naomi Elster, Variables/Essays and Opinions, Undark, 4-25-16). Should clinical trials be better regulated? Definitely. Should they be regulated out of existence? Definitely not. • The Insider's Guide to Accessing NLM Data (National Library of Medicine, NIH) A series of educational resources to help users explore more powerful and flexible ways of accessing NLM data, with a focus on accessing PubMed data via the E-utilities API. • The Truth Wears Off (Jonah Lehrer, Annals of Science, New Yorker, 12-13-10). Is there something wrong with the scientific method? The "decline effect": The decline of significance in positive results from clinical trials -- results that are rigorously proved and accepted -- start shrinking in later studies. This can be explained by selective reporting, regression to the mean, and positive publication bias. "Our beliefs are a form of blindness," writes Lehrer (e.g., results from trials on acupuncture are more positive in Asia than in the West). Early termination of trials that show a positive result could also enshrine a statistical fluke, adds one reader. • Discovery, Interrupted: How World War I delayed a treatment for diabetes and derailed one man’s chance at immortality (Jeffrey Friedman, Harper's Magazine, Nov. 2018) Wonderful medical history, about a soft-spoken medical researcher at the Rockefeller Institute during World War I, Israel Simon Kleiner, who had determined the basic principle that an extract from the pancreas could be used to develop a way to reduce blood sugar in patients with diabetes -- but who was asked to leave because research on diabetes was not nearly as important as research on infectious diseases. Two others discovered insulin, based on Kleiner's work, and got a Nobel for it. Only much later would diabetes become a national health crisis. Not about the NIH, but definitely worth a read.